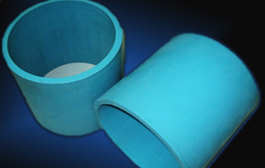 Tetron BL is a unique ceramic filled PTFE with elastic behaviour under mechanical stress. The alloyed material has low heat conductivity and chemical inertness. It has excellent tribological friction and wear properties over glass fibre filed PTFE, causing less abrasive wear with lower permeation. Do not use in food applications.